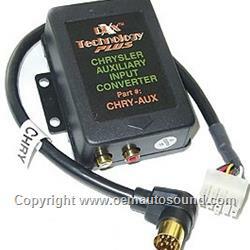 Pie chry-aux interface for Chrysler Radios, This adapter lets you input audio from any portable audio device iPod iPhone Android phone Mp3 player, DVD, and satellite radio through the Chrysler Jeep Dodge sound systems, by converting the factory CD-changer input into an auxiliary input port. 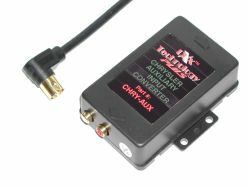 Chrysler Dodge Jeep Auxiliary input adapter. Radio must be one of the following CD-changer controller head unit. 5-Preset radio with 5-band Eq disc and disc on preset 1 and 5 and mode button. 6-Preset radio with bass and treble slide controls "Direct disc select" 1-6 Printed above radio. Presets and "Mode/Eject" button 8-Pin din at head unit.